It is the subcutaneous vein of the upper extremity. It is sometimes denoted as “antecubital vein”. The term cephalic refers to the anatomy of the head. It is located on the lateral side of the left and right arm that runs from the hand to the shoulder. It is not a deep or distal but a superficial vein and hence clearly visible through the skin. It arises at the radial border of the dorsal venous network of the hand. Here, an accessory cephalic vein, which is a variable vein, passes along the radial border of the forearm to join the large blood vessel near the elbow. A median cubital vein, which is another superficial vein of the upper limb, rises from the antecubital vessel in the bend of the elbow to join the basilic vein. The superficial vein passes between the deltoid and pectoralis major muscles and pierces through the clavipectoral triangle, the part of the anterior thoracic region bounded superiorly by the clavicle. It finally empties into the axillary vein to become the subclavian vein, which in turn empties into the superior vena cava. Cephalic vein cut-down approach is a common technique used to permanently place artificial pacemakers in the subcutaneous vein in the deltopectoral groove. 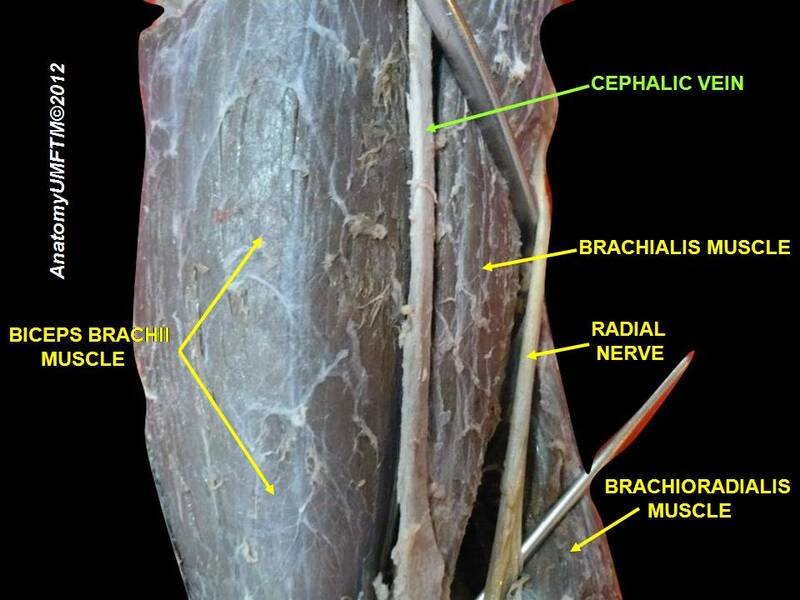 A brachiocephalic fistula formed by connecting the brachial artery to the subcutaneous vein above the elbow during hemodialysis ensures a greater flow of blood. This procedure is also called cephalic vein transposition and typically performed in case of a hemorrhage or trauma. Formation of a blood clot in the superficial vessel leads to deep-vein thrombosis (DVT). Subsequent inflammation of the antecubital vein results in a host of fatal conditions. In such a case, prompt treatment is necessary that may range from medications to surgery. Mild cephalic vein thrombosis can be managed by keeping the affected arm elevated, application of heat to the affected area to reduce inflammation, and use of support or compression stockings. Use of nonsteroidal anti-inflammatory drugs (NSAIDs) and other painkillers is also found to alleviate pain and swelling. Increased mobility may aid in the management of the symptoms. Walking, consuming lots of water, stretching can help in preventing further development of cephalic vein thrombosis. Further, upper extremity DVT (UEDVT) can develop in the neck or arm region and move towards lungs and restrict the flow of blood leading to a condition known as pulmonary embolism (PE). UEDVT account for about 10% of all DVTs and is known to affect about 3 in every 100,000 people. The symptoms of a UEDVT are unclear as they can also be symptoms of another host of conditions. Sometimes, it could be asymptomatic also. UEDVT can have a host of causes. Some of them include the following. UEDVT arising due to physical activity accounts for 20% of all UEDVTs. They are spontaneous and rare. It can arise due to sometimes even simple day to day physical or strenuous activity, especially like rowing, swimming, pitching a baseball can cause thickening of the veins due to which they can become blocked, narrowed, or pinched. It can lead to reduced blood flow and cause a clot. This type of UEDVT is typically more seen in young healthy athletes and more in men when compared to women. UEDVT’s can result from medical procedures such as the insertion of a central venous catheter or pacemaker. Insertion of the catheter, a flexible and thin tube, to deliver medicines can injure the blood vessels. Additionally, foreign object insertion in the veins can also lead to a restriction of blood flow, which, in turn, is one of the risk factors for developing DVT. Long-term use of catheter or insertion of it for the purpose of dialysis above the waist is also known to cause UEDVT. UEDVT can result from a fracture involving the clavicle, humerus, or ribs or any injury in and around the muscles surrounding the blood vessels. Some people may have an abnormal muscle insertion or an extra rib the chest that arises from the seventh cervical vertebra. The extra rib, also known as a cervical rib or neck rib is located above the normal first rib either on right or left side. It could be a congenital abnormality and known to occur in 0.2% to 0.5% of the population. Visible on an x-ray or a Computed tomography (CT) scan, the cervical rib is not clinically relevant and shows any symptoms. However, with repeated motion, it can injure or irritate veins or nerves in the lower neck to armpit region resulting in a condition known as thoracic outlet syndrome (TOC). TOC can also cause a UEDVT. A swollen, aching, and bluish coloration on the arm, occurring usually after strenuous physical activity could be an indication of compression of the subclavian vein that is associated with TOS. Alternatively, could also suggest Paget–Schroetter syndrome or effort-induced thrombosis when the condition is coupled with thrombosis. UEDVT can develop due to certain congenital disorders or medical conditions which lack or have abnormal blood coagulation proteins cause the blood to clot more often than it should lead to a hypercoagulable state. UEDVT can also be caused by connective tissue disorders like lupus or cancer. At times the underlying cause of secondary UEDVT cannot be determined. Magnetic resonance imaging (MRI): MRI uses radio frequencies and a large magnetic field to visualize and capture comprehensive pictures of soft tissue and blood vessels. Venography: Here, a special dye is first injected into a large vein. Later, an X-ray shows the flow of the dyed blood in the vein where a clot is suspected. Thrombolytics are a class of drugs which have the ability to dissolve blood clots. The procedure can be carried out by injecting the medicine into the suspected vein so that bloodstream delivers the drug to the clot. Alternatively, a catheter carrying the drug is inserted into the vein and the medicine is delivered directly to the clot. The latter method is best suited in conditions where it used within two weeks of showing first symptoms. This treatment modality can have serious complications including bleeding in the brain or internal bleeding. Hence, it used only when the clot poses life threating effects. In order to reduce the incidence of blood clots, blood thinners are administered for UEDVTs. Warfarin (Coumadin) is one among the commonly prescribed blood thinner. Use of Coumadin requires a periodic blood test to ensure the usage of right doses. However, certain newer blood thinners like apixaban, edoxaban, and rivaroxaban don’t require periodic monitoring and can be used up to one to six months depending on the severity and position of the clot, and its response to treatment. Physical interventions for treating UEDVT are risky and are used to treat a severe form of UEDVT.